There are times when you accidentally get your important data deleted on your computer, while you encounter a virus infection or do PC formatting, and have the feeling that you may lose your precious files forever. Don’t worry about that because you can recover them with ease. First of all, files that are deleted on your computer will go to the Recycle Bin first, therefore all you need to do is to recover files from Recycle Bin. Besides that, we prepared the following ways for you to fully understand how you can get your data back even in case they were deleted from the Recycle Bin. If your files are just deleted from the folder where they are saved, then you may still find them in the Recycle Bin. To recover them, just open Recycle Bin and locate the file that you want to recover. Once you found it, right click on the file and then choose “Restore”. The file will then be restored to its original location. In case you previously emptied the Recycle Bin and cannot restore deleted files from Recycle Bin directly, you can still utilize Windows’ Backup and Restore feature to find your lost data. Firstly, open the folder where your file(s) used to be located. Secondly, click on “Home” > “History” and then “Previous” and “Restore” buttons to get the file(s) back. 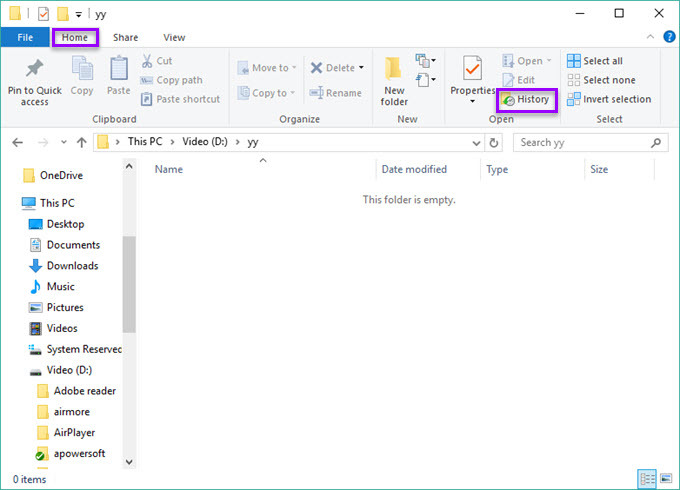 Sometimes, “History for every folder” is turned off, thus, you cannot have your file(s) back. However, in this occasion you can refer to the files recovery apps given below to solve the problems. ApowerRecover is a data recovery app that can help you undelete file from Recycle Bin and any other location on your computer. The tool can retrieve files whether they are on the computer’s hard drive, memory card, hard disk, camcorder, digital camera or even flash drives. With this powerful software, all kinds of file formats such as videos, photos, documents, audios, emails and more can be found and recovered. Now let’s check out how to use it. Download and launch the application on your computer. On its interface, choose what kind of file you need to recover. You may choose photos, docs, videos, email, archives or all data. Click “Next” and you will be asked to select the exact location where the file was located. You can choose “Recycle Bin”, click on “Next” again and wait for the app to scan the selected area. Once done, choose the file that you want to retrieve from the list and click on “Recover”. Use “Browse” to select the location where you want the recovered data to be saved. Afterwards, simply click “OK”. In a few seconds, you will restore deleted files from recycle bin. Another helpful tool is EaseUS Data Recovery Wizard. 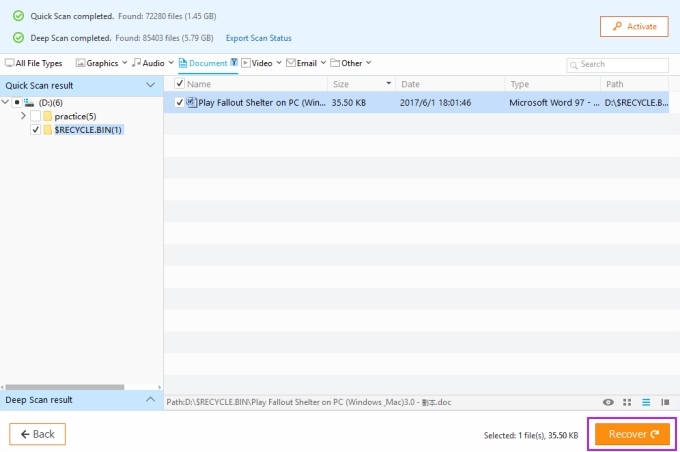 Just like the first one, this tool can also recover various kinds of data from different folders on your computer. After you launch the application on the computer, choose a location where you recently deleted your file. Next, click the “Scan” button to allow the tool to search for the files. As this program doesn’t have “Recycle Bin” option for users when selecting the scanning location, users need to select one partition and when the searching process is completed, choose the “$RECYCLE.BIN” folder from the scan result on the left. Next, check the file(s) and click “Recover”. 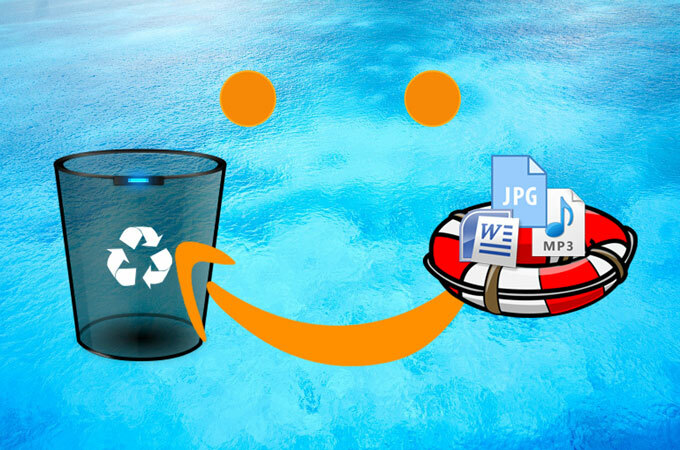 Now you can recover files from Recycle Bin. From the table above, you can clearly understand the pros and cons of each solution. 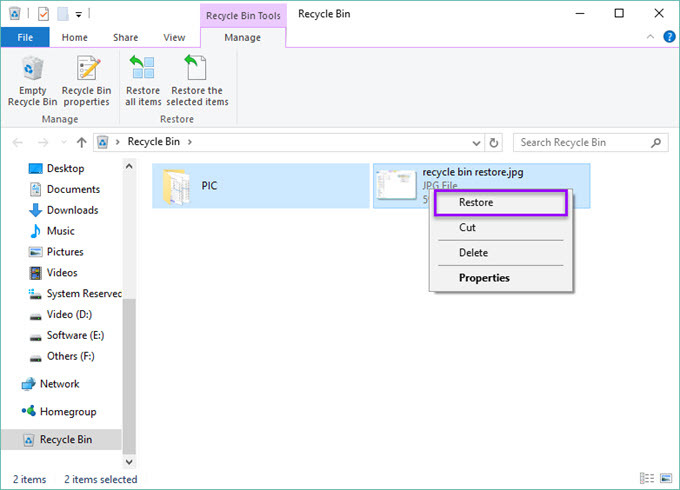 Although you can search for files from the recycle bin and select multiple items to recover, it would be complicated if your recycle bin contains too many files and the objects you want back are not listed together. And the preview feature in the recycle bin is only available for pictures, documents and folders cannot be previewed. As to EaseUS Data Recovery Wizard, it cannot choose the file type before scanning, however, you can find your deleted items according to the type and path. Unlike ApowerRecover, which gives you the options to scan deeply after the standard scanning mode, EaseUS automatically jumps to deep scan after quick scan. To sum up, ApowerRecover could be your intelligent companion whenever you want to undelete file from Recycle Bin. It gives users more options during the operation. But if you would like to find lost data more thoroughly, EaseUS is also a great choice.